Adaaran Club Rannalhi is featured among the best hotels in Maldives and sits exclusively at the tip of the South Male atoll within the exotic collection of islands known as the Maldives. Its unique location offers access to pristine beaches, excellent scuba diving opportunities and a relaxed environment with easy access to the capital city of Male. Bask in the golden sun and frolic on the soft sands as you experience friendly Maldivian hospitality and explore the rich tropical wonders of a vibrant island nation during your stay at our inviting Maldives hotel. The 96 standard rooms offer elegant, Maldives accommodation at Adaaran Club Rannalhi and boast all modern conveniences while complementing the natural surroundings adding to the ambience. Our property which is featured among Maldives luxury hotels lets travellers choose from either a terrace or balcony view both providing unhindered views of the ocean crashing on golden shores or the verdant gardens. Step out of your sanctuary onto the soft sand and enjoy drinks or a private in room dinner under the guise of the clear blue skies. 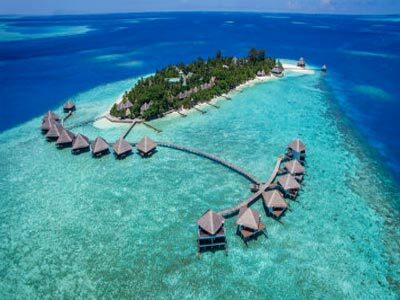 When looking to spend your holiday upon the atolls of Maldives, accommodation will be a significant factor in creating the mood for your exotic Island getaway. The 34 spacious and secluded Water Bungalows at Adaaran Club Rannalhi offer panoramic ocean views giving access to the changing scenery when day turns to night. Imagine your own slice of paradise just a few feet away from the clear blue ripples of the sea. All Bungalows offer direct access to the clear ocean waters should you feel the need for a dip or bask under the glistening solar rays on the private sun deck exclusive to Adaaran Club Rannalhi Water Bungalows. Witness the end of a warm sunny day and the beginning of a wonderful evening. Let the evening begin with a beautiful sunset while witnessing the amazing sight with your loved one, family. The Maldives is indisputably a paradise for the avid sports fisherman. In the waters of this magical environment numerous well known sport fish exist, making it an unforgettable venue for adventure and nature enthusiasts alike. Morning fishing in Maldives is one of the most commonly experienced modes of sport fishing in these waters. When the first rays of the tropical sunrise touch the sapphire waters of the Indian Ocean, the local dhoni vessels set sail with fishing aficionados on board. The picture perfect spotless beaches and luxurious facilities of the Maldives resorts without a doubt provide a great options for your vacation time. But for the visitor who desires to obtain an authentic insight into the lifestyle of the local Maldivian villagers a visit to a fisherman’s island will prove delightful. Organized Maldives Island tours will take the traveller to one of the typical serene local fishing villages. Male, the capital of the Maldives Islands is a thriving city of about 100,000 people. This charming city boasts a number of recognized landmarks which should be on the itinerary of every visitor planning a Maldives city tour. Not to be missed is the Male Fish Market, where the visitor will find a myriad of freshly caught sea creatures and the opportunity to obtain an insight into the traditional Maldivian lifestyle. Test your fishing skills in a traditional Maldivian dhoni, around the reef where you are very likely to have a big catch. Enjoy the cruise under the stars when getting back. Want to get to know more about MALDIVES!!! what better way is there than to visit a local island of Maldives. After breakfast at the hotel. Enjoy your day at leisure. Maldives is a paradise for adventure and sports lovers. Go water skiing, water skiing, wind surfing, water surfing, snorkeling, sailing and windsurfing, or enjoy beach volleyball and basketball (optional tour price is not included in the main tour package price. Dinner at Hotel. After breakfast at the hotel. You can explore Maldives further and enjoy the activities available at resort on your own. Dinner at hotel. 03 Night's stay at selected room. Airport - Hotel - Airport transfer on Speed boat.